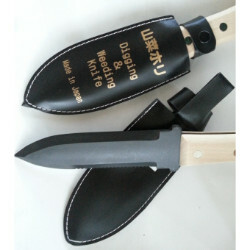 The Hori Hori knife is a multi purpose gardening tool that can be used for planting, weeding, cultivating, and cutting tough roots. Serrated blade on one side, straight on the other. Wood handle and black vinyl case.